Some spaces are just odd enough or unique enough that traditional sized or shaped cabinets just won't do. Breitzke Carpentry enjoys the challenge of producing one of a kind cabinets and built-ins that will compliment the space and the clients they are for. If you are looking for one of a kind bookshelves, fireplace surrounds, mantles, wine racks, desks, pantries, or just cabinets, Breitzke Carpentry can help design the right look for you. One of a kind wine rack. Maple, Aluminum, Rhino Liner. Detail of wine rack. Maple, Aluminum, Rhino Liner. Sapele Vanity. This vanity seems to float. It is lightly supported by the edge of the tub allowing towels to be easily accessible. Sapele cabinet with granite top. Pantry/Mudroom at Southern Living Idea Home Davidson Gap. Painted poplar cabinets with cork inlays in the doors for notes, and a river stone floor. Detail of Pantry/Mudroom at Southern Living Idea Home at Davidson Gap. Painted poplar cabinet, cork inlays in doors, river stone floors, and stainless counter (counter not done by Breitzke Carpentry). Detail of Pantry/Mudroom at Southern Living Idea Home Davidson Gap. Painted poplar cabinet, Hard maple seat top, and river stone floor. Daybed at Southern Living Idea Home Davidson Gap. A comfortable spot for reading or napping with storage underneath. Painted poplar with hard maple tops. Bookshelves Adjacent to Daybed at Southern Living Idea Home Davidson Gap. Painted poplar with hard maple top. Cubby Hole Built -In. Nice simple lines and floating shelves really set this niche apart. Painted poplar cabinet and shelves with hard maple top. File Drawers for His and Hers Desk. Painted poplar cabinet with hard maple top. Bookshelves that Flank Fireplace. Painted poplar bookshelves, painted poplar fireplace surround, painted poplar columns, hard maple tops, handmade ceramic tile around fireplace, and slate hearth. Detail of Bookshelf, Column, and Glass Door Cabinet. Painted poplar with hard maple tops. Bookshelf on Stair Landing. Painted poplar with hard maple tops. Artists Desk. Quarter sawn white oak. Artist Desk. Quarter sawn white oak. Folding Ladder and Railing. This oak ladder is truly one of a kind. The brackets that hold if flow right into the handrail above. Breitzke Carpentry Designed and built every component of this system. Oak and painted steel. Detail of ladder being stowed. Oak and painted steel. Sapele Bookshelves. Floor to ceiling bookshelves really look handsome in this library. All sapele construction. Sapele Bookshelves with Window Seat. All Sapele construction. 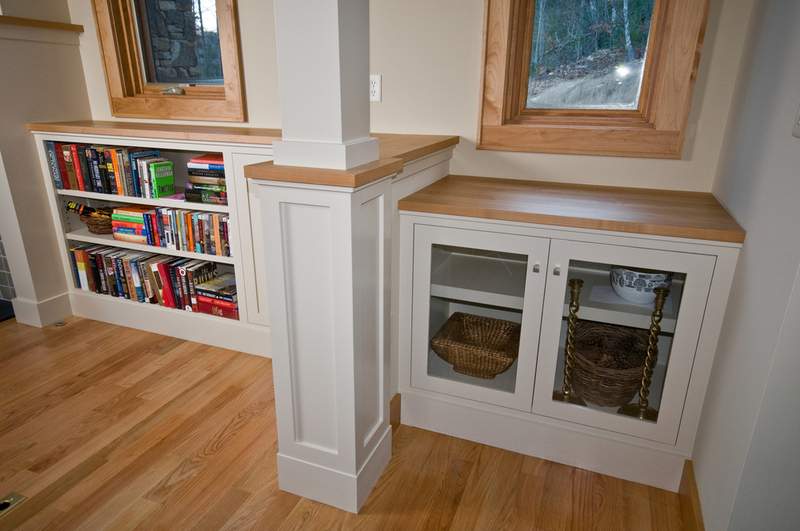 Breitzke Carpentry LLC of Asheville, North Carolina has a diverse range of options for all types of cabinetry. Whether you are looking to match an existing built-in or cabinet, or you are looking to make a one of a kind show piece, let Breitzke Carpentry help you bring it to life.